Guys. How the heck is it August?! I seriously feel like I'm still trying to catch up from the beginning of the year. But nope. It's August now. The start of a new month, and what a better way to start fresh than by sporting this top. It's a super lightweight sweater that I had fallen in love with in the Anniversary Sale catalog. It was sold out in the store when I had my shopping spree, but I was able to order it online after the fact. Is it too overboard to pair a bright pink bag with with bright pink shoes? I couldn't resist. Florals and bright pinks. That's got to be some magic potion to ensure that August is the best month ever. I love your casual, girly look! The pink bag paired with the pink shoes is perfect!! I love your shoes they would be so perfect for the wedding I am going to lol, this outfit it bright and cheery. Haha! Again, it would be so much easier if we could just share! Loving the floral and bright pink! Such a fun, girly look! That sweater is on my Nordstrom picks and I'm still deciding if I'm going to get it or not. My vote is to get it! It's great and will have awesome layering potential in the winter! That sweater looks much cuter on you than on the website. LOVE it paired with white jeans! I think only bloggers would think pink shoes and bag are too much. Everyone in real life will probably compliment you on how well you match today!! ha ha. Haha I know right! I love this bag tho and I don't wear these heels enough. I bought them with Matt's slot machine winnings. True story. Love the sweater so much. Thanks for solidifying that! 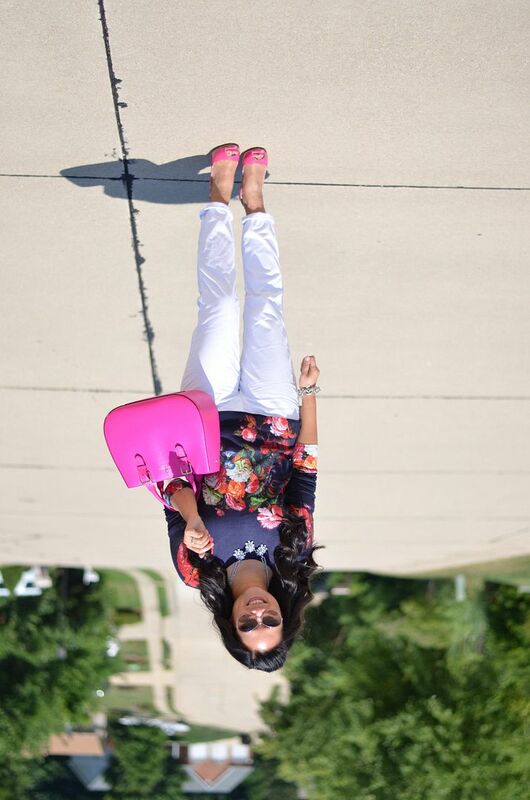 The shoes & bag are perfect together - pink is always a great color! It is totally a super look - keep it up!!!!! The bright pink bag and shoes are perfect with the sweater! I love when I can get something online that is sold out in the store! You look gorgeous!! Thanks so much! And yes, thank goodness for online ordering!! 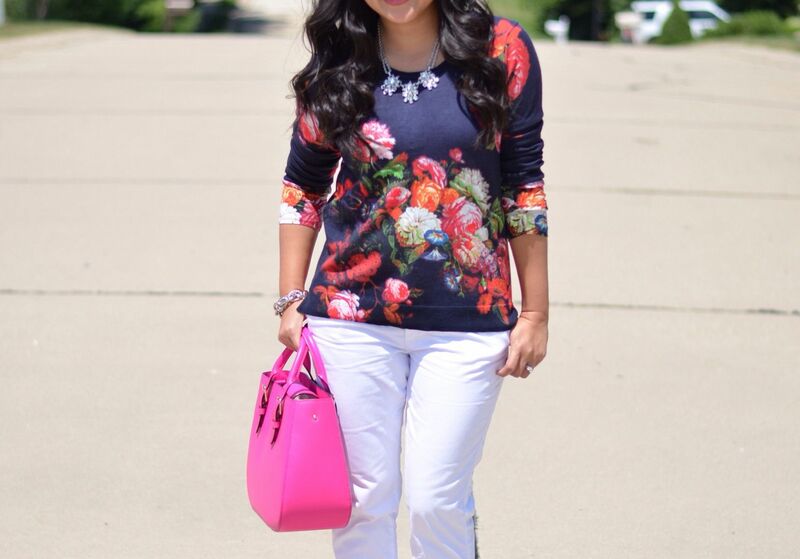 Love the floral sweater with the pops of pink! Glam and feminine! Love that purse and those shoes! You can't go wrong with pink! Definitely not. I do tend to go overboard a bit, but I can't help it! Especially with pink! Very pretty look girl! Love the pops of pink. I never seem to tire of florals. I have always loved them and this is beautiful. I love the navy with the pink florals, the pink bag and your shoes, you look great! I feel the same way about never getting sick of florals - thank you! Definitely not too bright! It looks fabulous! So pretty! Love. Love. Love. Love. Love. Love. And another LOVE just for good measure. 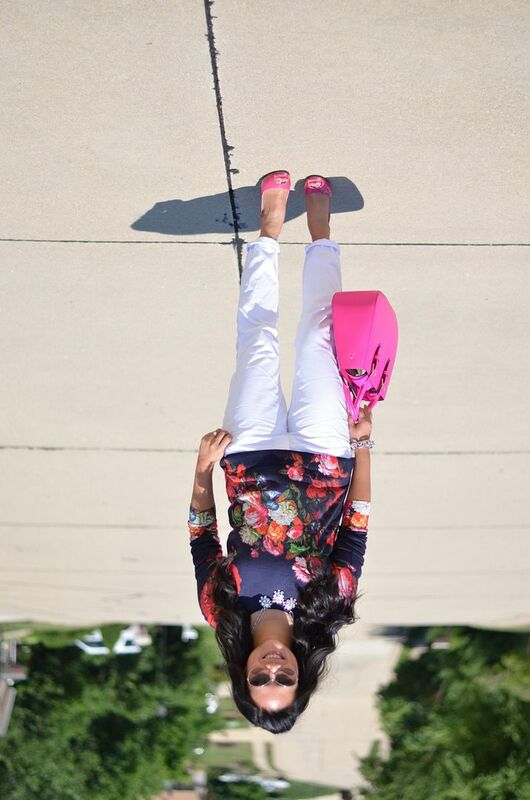 Even though the pink is too pink for me, you completely pull it off with the floral top! Love it on you!! Enter the 1st anniversary giveaway on the blog now..
Love the pink heels - can never have too much pink! Yay - thanks for agreeing! I am loving the hot pink - you look fab. Thanks for sharing and linking up with us again at the #WWDParty! That bag! I need it in my closet! Florals are my favourite so I love this. That is the most super gorgeous bag ever. I just love this bag too! Thank you! Thanks! Figured a pop of color was just what this sweater needed to finish the look! Carylee there never ever can be enough pink hahaha. You totally rock this girly ensemble. I do love love this floral top. And yeah I know cant believe its already August. Have a wonderful start in the week dear. Haha, I'm so glad there are a lot of pink lovers out there! Thanks! And let's slow down summer now! Nope...the pink pumps are perfect! :) I didn't see that sweater and I combed through the catalog! It's really cute and I love your sunglasses. It was hiding under a leather jacket, and it looks more cobalt in the catalog than navy! It's still great regardless, though! I love this look, especially the statement necklace! Thank you so much! It was a great way to finish the look!